Vision dominates philosophical thinking about perception, and theorizing about experience in cognitive science has traditionally focused on a visual model. In a radical departure from established practice, Casey O'Callaghan provides a systematic treatment of sound and sound experience, and shows how thinking about audition and appreciating the relationships between multiple sense modalities can enrich our understanding of perception and the mind. 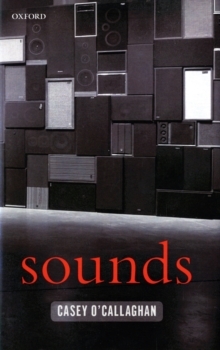 Sounds proposes a novel theory of sounds and auditory perception. Against the widely accepted philosophical view that sounds are among the secondary or sensible qualities, O'Callaghan argues that, on any perceptually plausible account, sounds are events. But this does not imply that sounds are waves that propagate through a medium, such as air or water. Rather, sounds are events that take place in one's environment at or near the objects and happenings that bring them about. Thisaccount captures the way in which sounds essentially are creatures of time, and situates sounds in a world populated by items and events that have significance for us. Sounds are not ethereal, mysterious entities. O'Callaghan's account of sounds and their perception discloses far greater variety among the kinds of things we perceive than traditional views acknowledge. But more importantly, investigating sounds and audition demonstrates that considering other sense modalities teaches what we could not otherwise learn from thinking exclusively about the visual. Sounds articulates a powerful account of echoes, reverberation, Doppler effects, and perceptual constancies that surpasses the explanatoryrichness of alternative theories, and also reveals a number of surprising cross-modal perceptual illusions. O'Callaghan argues that such illusions demonstrate that the perceptual modalities cannot be completely understood in isolation, and that the visuocentric model for theorizing about perception -according to which perceptual modalities are discrete modes of experience and autonomous domains of philosophical and scientific inquiry - ought to be abandoned.